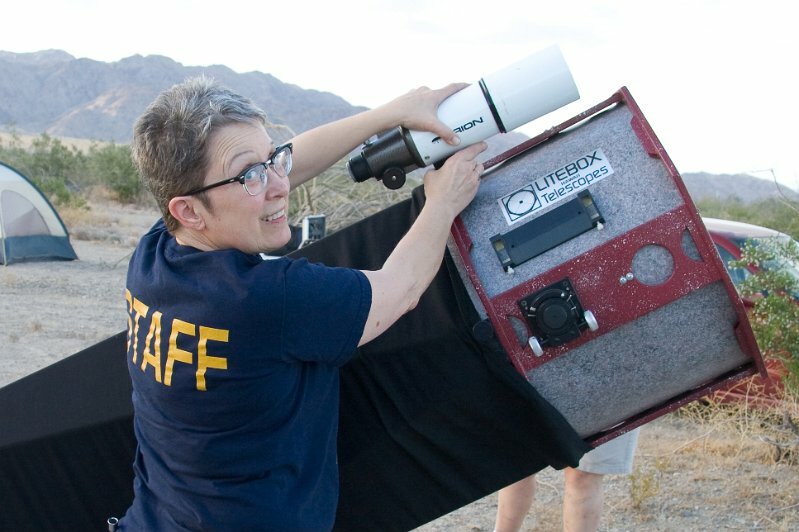 Setting up my favorite Pluto hunting telescope, a 17.5 inch f/4.5 Litebox reflector. Oh, in case you were wondering, its name is Hagrid. All my telescopes have names. 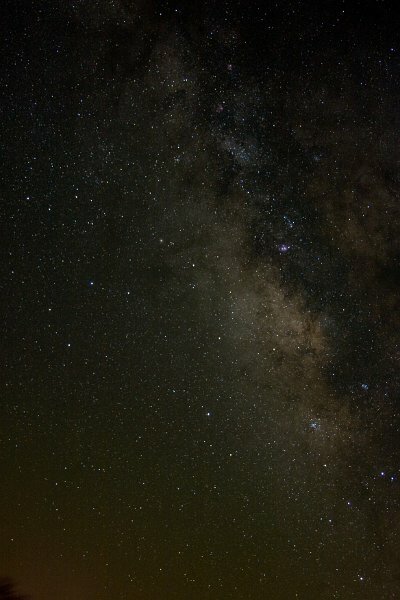 Do you see the Sagittarius teapot and the Milky Way "steam" rising from the spout? How about M24, the huge Sagittarius starcloud (the oval of stars 1pm above center) where Pluto hides? 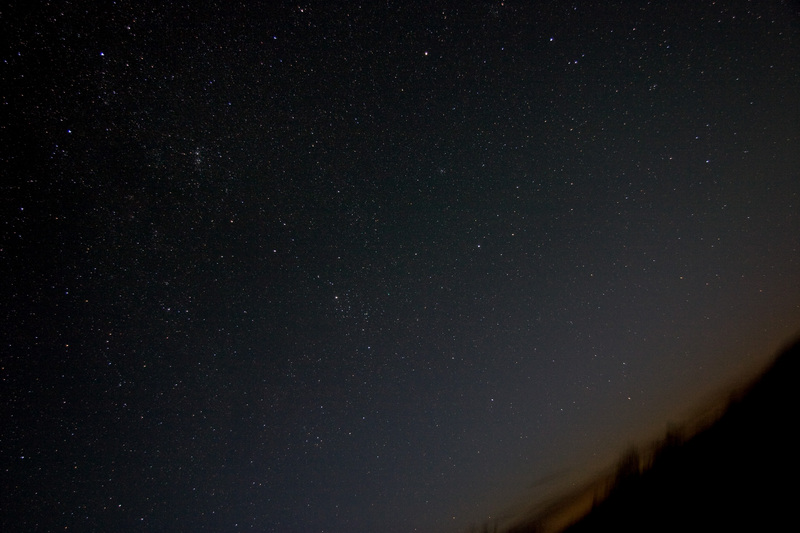 Bonus picture: This is the "naked eye" view of the sky where Comet McNaught can be found. Can you see the green comet near the Perseus Cluster? If not go to Mojo's Blog for closeup. Click to enlarge. It took binoculars for most of us to spot the first time. Every couple of years I get the yearning to see all the planets in one night. Saturday night, June 12 seemed like the perfect opportunity. Our Old Town Sidewalk Astronomers club planned an outing to our regular observing spot, Chuckwalla Bench, which has very good horizons. We needed good horizons to catch Mercury rising just before sunrise. Here are my planet observations, in observing order. All distances are listed in astronomical units and represent the distance from Earth on June 12, 2010, the night of my observations. Earth! Facing away from the setting sun, the Eastern horizon turned shades of blue above the pinkish sky. That’s the shadow of the Earth! The dark blue band seems to rise above the landscape and spans 180 degrees. The pinkish sky above the shadow is the antitwilight arch. As the sun sets, the boundary between the reddened (pink) color and the horizon grows until it blends with the darkening night sky. The same thing happens at dawn of course. Look for it, and tell me what you see! Venus! The first “star” to appear in our sky after sunset was Venus. Through the telescopes its gibbous phase is unmistakable! Its distance from Earth is 1.2 AU (astronomical units). Mars! I was not expecting to see any features on Mars, since it is so far away and so small. Mars is 1.7 AU from Earth, but only half the diameter of Earth. I was surprised that I could see some dark markings, through a small refractor. When we checked a Mars map for the time of the observation, the large dark feature Syrtis Major was indeed right smack on the central meridian – the imaginary line in the center of the planet facing Earth at that moment. Saturn! What’s not to love about Saturn! The brownish cloud bands contrasted against the butterscotch hued planetary globe. The slender ring, appearing nearly edge-on, bisected the planet, showing a tiny glimmer of sunlight shining on the north side of the rings. Several moons were visible, though one of the larger ones, Dione, was transiting (crossing in front of) the planet on this night. I spotted Mimas and Enceladus — tiny beacons of light — hovering near the edge of the rings. Titan and Hyperion were on the same side, only further away. Rhea was on the other side. Dione’s shadow marched across the face of the planet for astrophotographers to capture. I didn’t see it visually. Distance from Earth is 9.4 AU right now. Pluto! This small icy world is 30 AU away from Earth. Once a planet, it is now a dwarf planet. But that doesn’t alter my enjoyment of seeing it through a telescope. 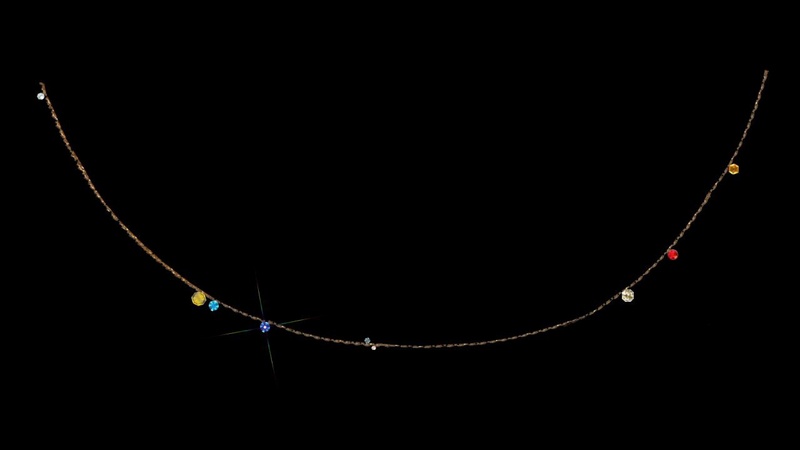 For the past few years, Pluto has been marching slowly towards the richest part of our Milky Way galaxy making it a challenging object to confirm in backyard telescopes. Right now it is found skimming the Northern border of M24, the Milky Way Star Cloud. 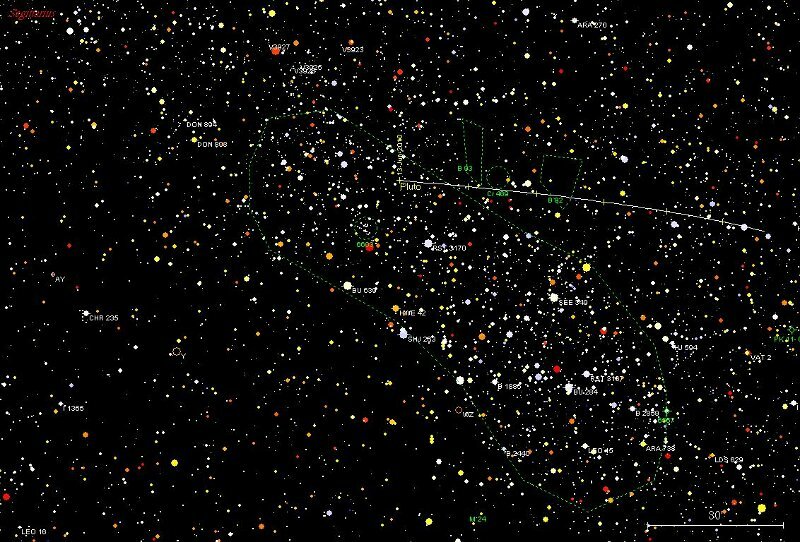 That’s a lot of stars to wade through to find one dwarf planet! I printed out star charts showing just the few surrounding stars and Pluto, indicating the motion over the evening so I could go back and verify the observation closer to dawn. I also made zoomed out charts, showing larger and larger areas of the region. I had some galactic luck this month! A small open cluster called NGC6603 was nearby to Pluto within the larger M24 open cluster. A few distinctive star patterns separated the dwarf planet from the small star cluster, and I was able to easily starhop and make a positive ID. With Pluto bagged, I was feeling confident about the rest of my planetary to-do list. Note: From July 4th through the 8th Pluto will pass in front of a dark nebula on the Northwest border of the M24 named B92. This should make the tiny magnitude 14 speck-of-a-former-planet easy to spot. Ceres, another ex-planet was nearby so I hopped over to have a look at it. Ceres spent half a century after its discovery in 1801 as our 8th planet. Then it was demoted to an asteroid, but its significance was cemented by its designation, 1 Ceres. After many years working the solar system as chief #1 asteroid or minor planet, in 2006 Ceres was promoted to dwarf planethood along with Pluto. Ceres is 1.8 AU from Earth, by the way. 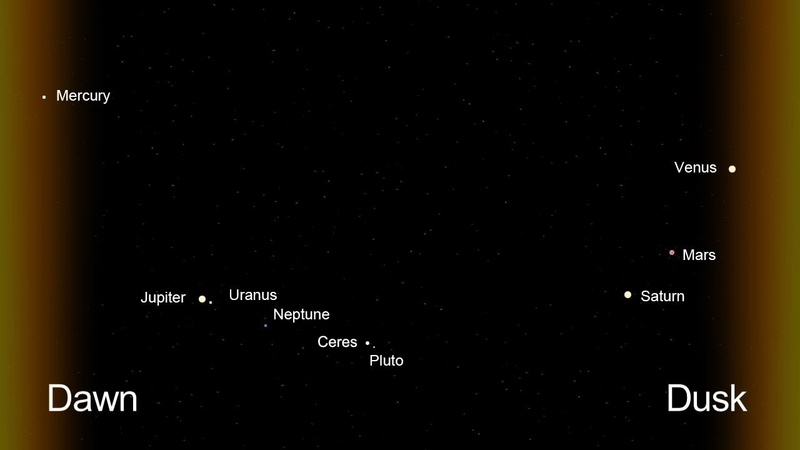 With the dwarf planet observations under my belt, I took a short nap to allow Jupiter, Uranus and Neptune to rise higher in the sky. Uranus and Jupiter! When two planets are at opposition at nearly the same time they appear to pass each other from our viewing vantage point on Earth. This year we will see Jupiter pass Uranus, then appear to loop backwards–in retrograde–passing near Uranus a second time, then resuming its forward motion with third final close pass. The next time this will happen is 2037, so you might want to aim your binoculars at this pretty pair of planets this year. This is the first pas de deux, so you have many months to view the dance of the two gas giants. Through the telescope, Jupiter, which is 5.1 AU from Earth, looked unusual to me. It was my first look at the planet since the Southern Equatorial Band disappeared. A few months ago, this chunky ruddy band went missing. Uranus has a beautiful aquamarine color. It has several moons just on the border of visibility through large amateur telescopes. I was able to spot three of the brighter moons of this planet — the ones farthest from the planet’s glow. Titania and Oberon on one side and Ariel on the other. A big ‘scope and good dark and steady skies help to see the faint moons! Uranus is 20 AU from Earth. Try looking up at Jupiter in a dark sky and see if you can spot a blue-green “star” nearby. Neptune! Neptune sports an azure-blue hue and appears like a tiny disc. It’s nearly 30 AU away near the southern tip of Capricornus. At this time of year, that means waiting until 3 am or later for a view. Now I had snagged all the planets except Mercury. 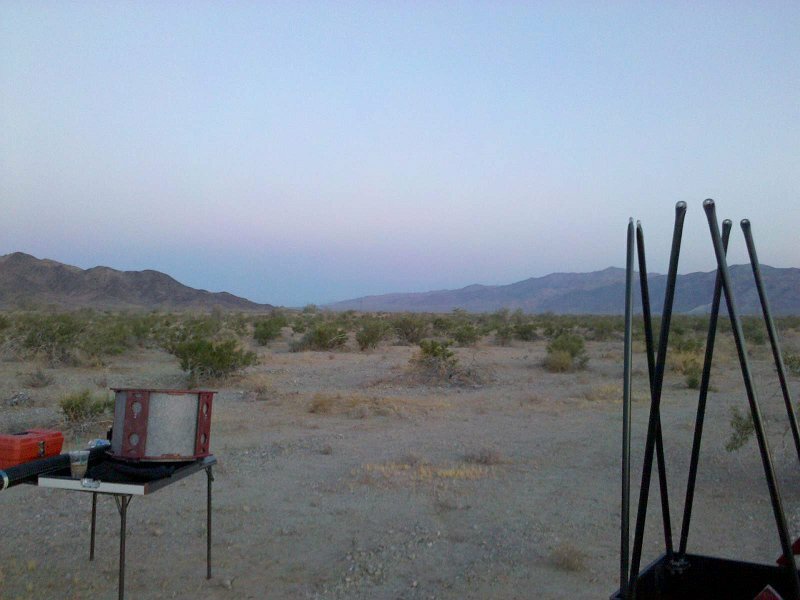 It would be rising an hour before sunrise at 5:30 am, but the elevation of hills on the SE horizon were difficult to measure. I kept my eyes on the Pleaides star cluster as Mercury would rise directly below the famous cluster. By 4 am, with an hour and a half until sunrise, the sky was already brightening. First, the glorious Milky Way faded until it was nothing but a memory. Then, one by one the constellations disappeared, except for their brightest starry ambassadors. I steadied my binoculars as the Pleiades or “Seven Sisters” disappeared one by one. I kept the remaining Pleiades stars in my binocular view while moved back and forth, scanning the horizon for Mercury. Soon the rays of pending dawn punctuated the horizon, and I worried that I’d miss it as sunrise made the landscape visible once again. I could still see some of the Pleiades, and kept looking for over 45 minutes. Finally, just a few minutes before 5:00 am, a bright beacon appeared on the horizon. It was Mercury! I had seen ten planets in the span of nine hours! The nine hours passed so quickly. With sunrise comes daylight and the views of the night sky fade from view but not from memory. 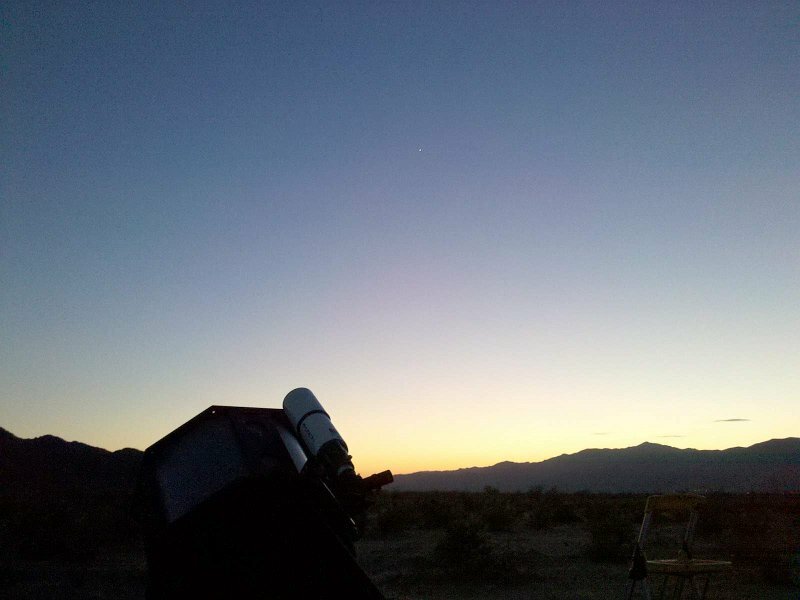 Join us out in the desert sometime or find a local astronomy club closer to you so you can see these wonders of our solar system for yourself! You really have to see this! Mercury Rising A nine planet observing night in 2001.